Love Varnish: It's Alive, and Matte! Hi guys! I have been playing around with matte topcoat a bit lately, so I thought I would show you one of my favourite combinations! I really adore the look of matte glitter, and since China glaze I'ts alive is such a gorgeous polish I thought this was a perfect match. 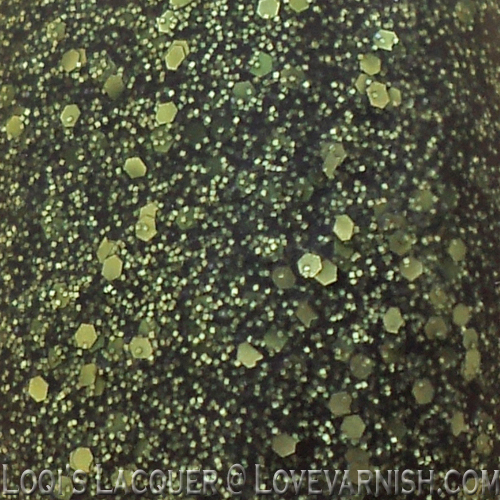 I am wearing 3 coats of It's alive, a green glitter polish with small and larger glitters, (you can see a gradient I did with it here) with one coat of matte topcoat (from Hema). So pretty! I hope you guys like it too and see you next week! Let me say, matte is the only way I can appreciate glitters. Love the look on this!